"HALIFAX ZOO! Most up-to-date amusement park in England! Great attraction for Whit Monday and Tuesday! Admission 6d" This announcement on May 29, 1909, and much early publicity attracted 41,000 people to Chevinedge that Whit weekend. Many surprises awaited them. 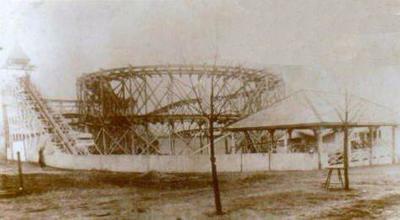 Extensive grounds, the amusement park promised by the advertisements, a lake still under construction and -greatest attraction- the new zoo. The enterprise was not completed for the opening day, but this did not lessen the enthusiasm displayed by people from many miles around. An elephant had accompanied the King Cross Band on parade in the streets. 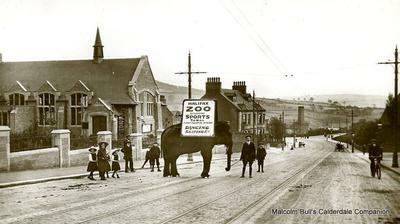 A sensation was caused when this elephant took fright at a tram and bolted near the bottom of Salterhebble, scaring the crowds that had been attracted, and finally stumbling and falling over. The animal recovered itself without injury. With a white Arabian camel this 17 year old elephant had walked from Halifax on arrival. Three truck loads of smaller animals had been delivered three weeks previously; and these, with the sight from time to time of strange vehicles bringing stranger animals and birds through the town whetted the anticipation of the people. There were no formal opening: the gates were simply thrown back for the crowds to pay their sixpences and enter- having mostly ascended Exley Bank from the relays of special trams that Halifax had provided. The zoo was well stocked, and up to the opening day the aviaries were being filled with specimens of gaily plumaged birds from South America and Australia, with an eagle and a vulture in their special cage. An Indian calf, born in the zoo the day before the opening, was on view. Two African lions, two bears, hyenas, jackals, wolves, zebras, a yak- all were there to greet the flocking crowds. 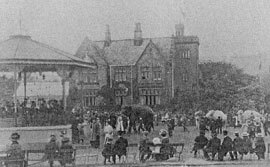 The monkey-house was a prominent attraction. A white dromedary from Egypt was still to come, as partner for the Arabian camel. A pigmy farm was a novel feature. Here one stepped over a stile and along a path leading to a tiny farmhouse fitted ready for a dwarf man and wife who were to occupy it. There were a model stable, pigsty and mistal, and pigmy animals moved about the farm. A full-grown sheep there weighed only eight pounds. The lake was to have a section for the display of tropical plants: it was to have its black and white swans, and ducks from China and India, and a fountain playing. 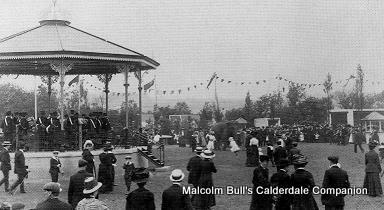 Music was provided by local and other bands from an ornamental bandstand while a refreshment conservatory was a popular rendezvous. This opening was enlivened by a grand firework display and a variety entertainment. Hiya,the zoo and mansion were situated where Chevinedge Crescent snd Siddal Rugby club now stand.I grew up in Exley,and in the 70s/early 80s,the roller skating rink was still there,along with the minituare train track. Great article. Was the site where Exley crematorium now stands?